Motion sickness medicine. 2 pills per pack. 25 packs per display. 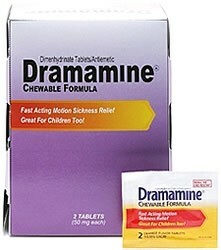 You are the only place we found that sold the individual packets of dramamine. It is just what we wanted for a birthday party dinner cruise on a boat. Many thanks. Order process very easy, timely delivery of product. I have no problem with the ordering process or delivery time taken. However, I note that the product only has a use period of just on 12 months which seems very short. So when I next place an order it would be good if had a longer use period since I don't use the product that often!